Immunohistochemistry-Paraffin: PKC alpha Antibody (MC5) [NB600-201] - IHC staining of PKC alpha in mouse brain using DAB with hematoxylin counterstain. 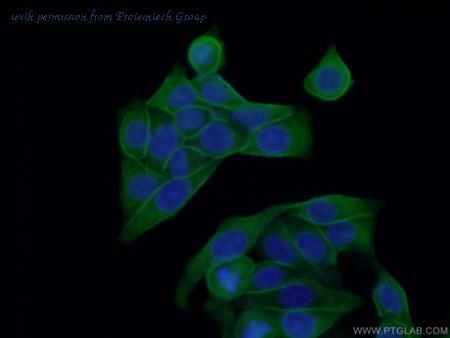 Immunocytochemistry/Immunofluorescence: PKC alpha Antibody (MC5) [NB600-201] - PKC alpha (MC5) antibody was tested in SH-SY5Y cells with Dylight 488 (green). Nuclei and beta-tubulin were counterstained with DAPI (blue) and Dylight 550 (red). 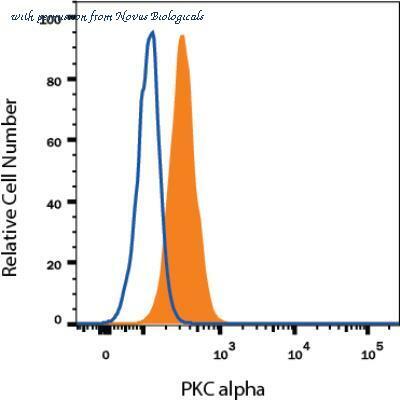 Flow Cytometry: PKC alpha Antibody (MC5) [NB600-201] - Detection of PKC alpha in Human HeLa Cell Line by Flow Cytometry. 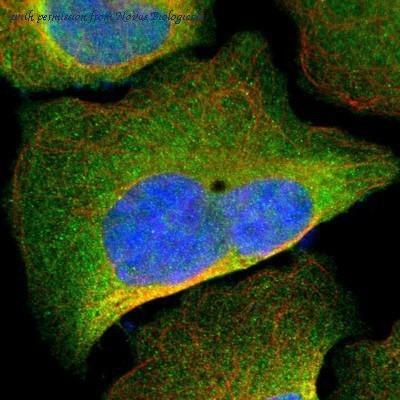 Human HeLa cell line was stained with Mouse Anti- PKC alpha Monoclonal Antibody (Catalog # NB600-201, filled histogram), or Mouse IgG2A isotype control (Catalog # MAB003, open histogram) followed by APC-conjugated Anti-Mouse IgG Secondary Antibody (Catalog # F0101B). To facilitate intracellular staining, cells were fixed with Flow Cytometry Fixation Buffer (Catalog # FC004) and permeabilized with Flow Cytometry Permeabilization/Wash Buffer I (Catalog # FC005). Images may not be copied, printed or otherwise disseminated without express written permission of Novus Biologicals a bio-techne brand. 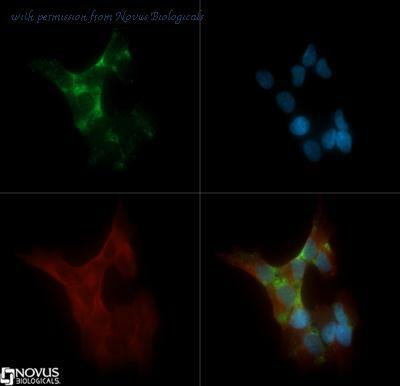 Immunocytochemistry/Immunofluorescence: PKC alpha Antibody [NBP1-87268] - Staining of human cell line U-2 OS shows positivity in plasma membrane & cytoplasm. 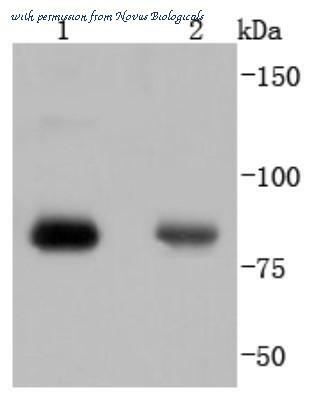 The PKC alpha antibody from Proteintech is a mouse monoclonal antibody to a recombinant protein of human PKC alpha. This antibody recognizes human, mouse, rat antigen. 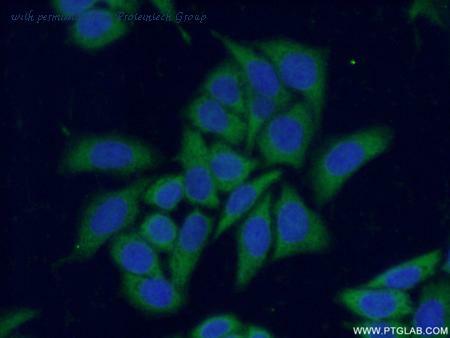 The PKC alpha antibody has been validated for the following applications: ELISA, WB, IHC, IF analysis. 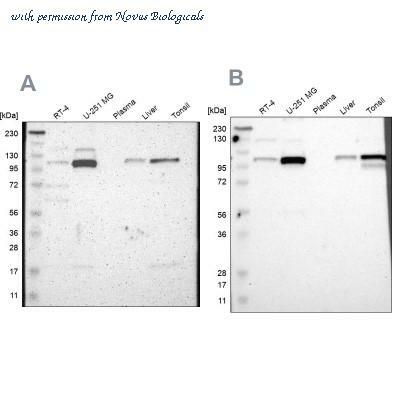 Detection of Human/Mouse/Rat PKC alpha by Western Blot. Western blot shows lysates of HeLa human cervical epithelial carcinoma cell line, Saos-2 human osteosarcoma cell line, Balb/3T3 mouse embryonic fibroblast cell line, and NRK rat normal kidney cell line. PVDF membrane was probed with 1 ╡g/mL of Human/Mouse/Rat PKC alpha Antigen Affinity-purified Polyclonal Antibody (Catalog # AF5340) followed by HRP-conjugated Anti-Goat IgG Secondary Antibody (Catalog # HAF109 ). 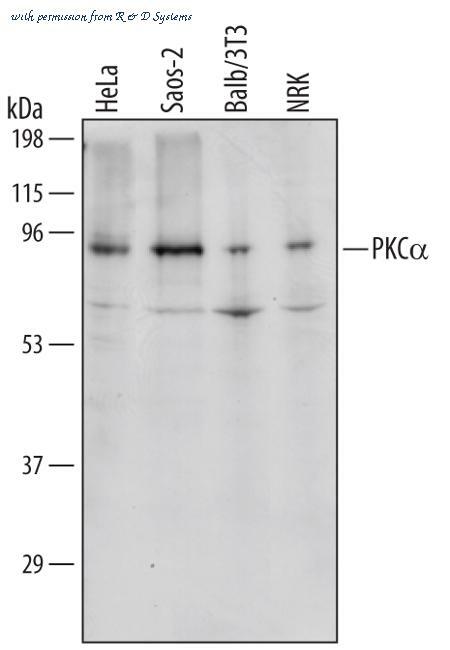 A specific band was detected for PKC alpha at approximately 90 kDa (as indicated). This experiment was conducted under reducing conditions and using Immunoblot Buffer Group 1 .